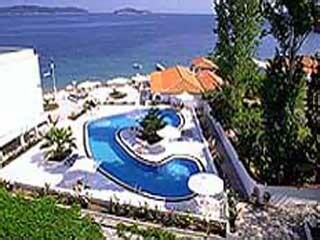 Welcome to Hotel Esperides of Skiathos, on the Achladies beach, only 4 km away from the town of Skiathos. 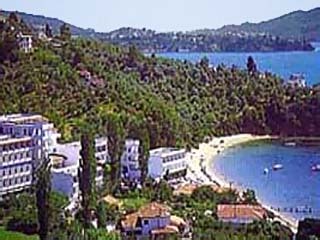 Hotel Esperides is a completely renovated in 2006, 4-star hotel that offers great vacation experiences while in Skiathos. It is conveniently located by the Achladies beach of Skiathos, and offers a modern beach bar that operates throughout the day and offers various drinks, snacks and lunch plates, accompanied by the crystal blue water of the Aegean. In the main building of Hotel Esperides of Skiathos, guests can make use of the bar, an open space restaurant, enjoy TV or read a book and play card games. On the beach in front of the hotel you can enjoy lots of water sports, sun beds and umbrellas. Also, scuba diving is available at Tzaneria beach, with Dolphin Diving. Snack Bar next to the Pool and the Sea. TV Room with a Satellite Antenna. Air Conditioning ( July - August ). Congress Hall for 250 persons. Playroom and Playground for children. Gift Shop with Articles of Folkloristic Art. 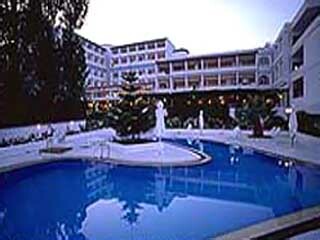 Hotel Esperides of Skiathos is a first class hotel and disposes of 180 rooms and one suite. All rooms have a bathroom, telephone, radio, TV, fridge, A/C and are cleaned daily. All rooms have balcony or patio with sea view, side sea view, or garden view. Select rooms have wireless internet access . Guests of Hotel Esperides of Skiathos have full access to the romantic swimming pool by the sea to enjoy the summer sun, away from the noise and crowds of the Achladies beach. By the pool, you combine relaxation with a refreshing cocktail that is served at the beach bar. 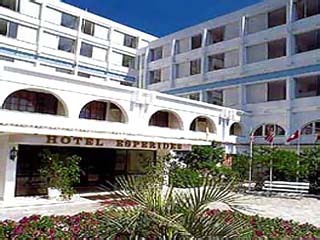 Esperides Hotel is 4 km away from the Town, the Harbor and the Airport. It is built next to the Sea and has been completely restored in 1995 and 1996. Open: May - October... Esperides Hotel is 4 km away from the Town, the Harbor and the Airport. It is built next to the Sea and has been completely restored in 1995 and 1996.